Zemana AntiLogger is a powerful anti-keylogger security software that provides protection against latest online and offline threats, spyware, worms, malware, SSL banker trojans, spybots, and keyloggers without slowing down the PC performance. Zemana AntiLogger adds an extra layer of essential protection to complement antivirus software. 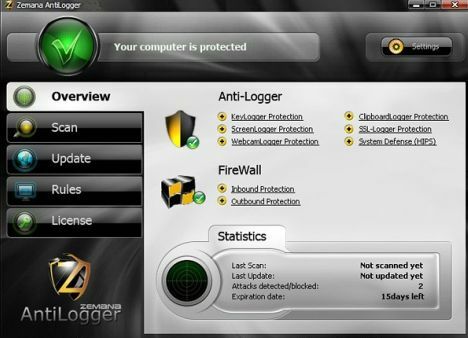 In addition, Zemana AntiLogger combines all the necessary safety features such as Anti-SSL Logger, Anti-Webcam Logger, Anti-Key Logger, Anti-Screen Logger, Anti-Clipboard Logger, and System Defense to keep the information security under control and made up of anti-action methods. Compatible with Windows XP, Vista, and Windows 7. Visit Zemana Facebook Fan page and click on the “Like” button and then click “buraya” button (shown as below image) to grab the legally 1 year license code. 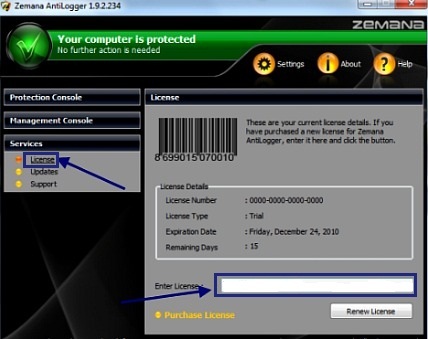 Once finished installing, run the Zemana AntiLogger and click on the “Service” –> “License”, then enter the license code received and click “Renew License” button to activate the free 1 year Zemana AntiLogger. Note: the license code is given free 1 year full version only for Facebook fan. Fill in the name, email address, and then click Senden button to register. An email from “Pro.de” will be sent to registered email address containing the license key and download link. Note: License key PROXMA-CHIP-2011 is same for everyone. Install and active the product with license key code received.